Located in The Sea Pines Resort at the southern-most tip of Hilton Head Island, South Beach is the home of The Salty Dog and within a short 2-minute walk to the beach. Offering weekly and nightly rates with all the amenities of a large resort and the personal touch of a local bed & breakfast. A quick walk to South Beach Marina, dining, shopping, fishing and watersports. Stay and play for a week or a day! 800-367-3909 or sbinn.com. 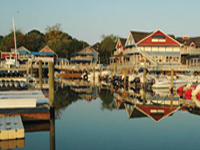 Hilton Head Island hotels, motels and inns offer casual elegance in the heart of the Lowcountry. Discover a wide range of world-class amenities including family-friendly accommodations, swimming pools, beach access and fitness centers. Hilton Head hotels offer ocean views, golf courses, conference facilities, banquet rooms, restaurants and more. Regardless of where you choose to stay, you’ll enjoy exceptional service and the vacation of a lifetime.